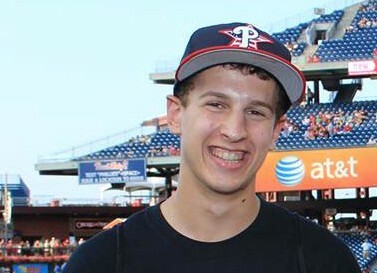 Cherry Hill East graduate David Golkow started the Athletes Against Bullying club in 2013. The club now holds anti-bullying training sessions for every sports team at the high school and consists of about 300 members. Cherry Hill High School East graduate David Golkow left quite an impression on his school community upon graduating last June. Golkow was the founder of Athletes Against Bullying, a club at Cherry Hill East focused on combating bullying within the school’s sports teams. The club’s popularity skyrocketed the past two years, with hundreds of students joining the club. Golkow received an Extraordinary Scholar Award from the Philadelphia Phillies for his efforts, and he was also honored along with other AAB executive board members at the New Jersey Statehouse in August. On Monday, Golkow will receive another award, this time from the Katz JCC. Golkow will be the recipient of the David Back Memorial Maccabi Award at the Katz JCC Sports Awards dinner. The award is given annually to a South Jersey JCC Maccabi Game athlete who displays strong leadership qualities on and off the field and maintains a strong Jewish identity. The award is named for David Back, a former Team South Jersey swimmer who died suddenly from an illness during his freshman year at Lehigh University in 1992. Golkow has been a multi-sport athlete for most of his life, and he played both baseball and basketball at Cherry Hill East. However, what makes Golkow stand out is the work he did in forming Athletes Against Bullying. The club first started in the 2013–14 school year with just 12 members. At the end of 2015–16, the club had expanded to about 300 members. However, Golkow said the club has grown in more ways than just its general membership. The club holds training sessions for each sports team at Cherry Hill East prior to the start of the season. The club also holds a number of social events and has gotten pro athletes such as former Philadelphia Eagles Vince Papale and Brandon Bair, and former Philadelphia Phillies pitcher Jamie Moyer, to speak at club meetings. Golkow admitted he wasn’t sure how his peers would receive the club when he first started it. However, the club appears to be sustainable for years to come. New officers have taken over the club this school year, and the club’s first meeting of 2016–17 was packed with students. “I know the guys controlling the club now have done a phenomenal job,” Golkow said. Despite all he did with AAB, Golkow admitted he was a little surprised when he found out he would be the 2016 David Back Memorial Maccabi Award recipient. Over the last couple of weeks, Golkow has learned more about Back’s story and some of the award recipients from past years. He said having his name added to the list of winners was an honor. Golkow is in his first semester of college at the University of Pennsylvania. Golkow wants to go into a business career, and attending the Wharton School of Business at Penn was an opportunity he couldn’t pass up. Though he is no longer in high school, Golkow plans to follow the progress of Athletes Against Bullying. Seeing the club succeed brings Golkow a lot of pride.